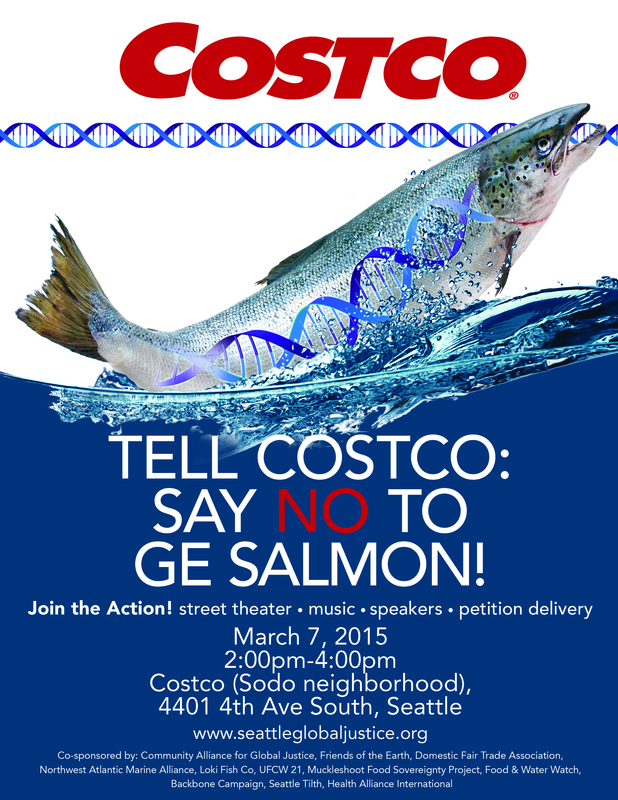 WASHINGTON, D.C. – On the heels of FDA’s approval of GMO salmon Costco Wholesale (COST), has made a public commitment to not sell GMO salmon. Friends of the Earth and a coalition of more than 30 consumer, health, food safety and fishing groups released the retailer’s statement today. Costco, the second largest retailer in the world, with 487 stores, and one of the largest retailers of salmon and seafood in the U.S., joins more than 60 other supermarket chains including Kroger (NYSE: KR), Safeway (NYSE: SWY), Trader Joe’s and Whole Foods (NASDAQ: WFM), now totaling more than 9,500 stores nationwide, in making a commitment to not sell GMO salmon. Walmart (NYSE: WMT), the world’s largest retailer, and Publix are among the last remaining large retail grocers in the U.S. that have not yet rejected GMO salmon. Also last Friday, Red Lobster, with 705 North American locations and more than 40 internationally, told the Dallas Morning News that it would not sell GMO salmon. Friends of the Earth and the coalition are calling upon the Senate to stand firm against an industry bill that would deny Americans the right to know about GMOs in our food. The fight for GMO labeling is now heading to the U.S. Senate, where industry groups are furiously pushing for a Senate companion bill to HR 1599, the DARK Act (Denying Americans the Right to Know) passed by the House of Representatives last summer. The bill would make it illegal for states to require labeling of genetically engineered foods. It is also possible that bill supporters may try to attach its provisions as a rider to upcoming appropriations legislation. Nearly two million people — including scientists, fishermen, business owners and consumers — who submitted comments to FDA opposed the approval of genetically engineered salmon due to the risks it poses to human health, environment and wild salmon populations. More information on health and environmental risks of genetically engineered salmon and a full list of stores that have made commitments to not sell genetically engineered seafood and salmon, letters sent to companies by Friends of the Earth and allies, and a list of coalition partners are available at www.gefreeseafood.org. Posted in Food Justice Blog Posts, News, Slider, Uncategorized. I won’t buy it…I will boycott it!